And by “deceitful” I mean Giffords Law Center and their rather ridiculous state-by-state scorecard on gun control policy, wherein they attempt to convince an unwary public that guns lead to mayhem (when in fact it is Giffords lawyers that lead intellectual mayhem). “Strong” gun control is associated with higher rates of violent crime (homicides, assaults and rapes). They handily omitted Washing D.C., which has very high violent crime rates. They included suicides (which we know are not a gun issue). They don’t cite sources for their data. Gun control scorecards are nothing new. The formerly important Brady Center used to annually publish their bit of intellectual fraud in scorecard format. And, every year the Gun Facts project used to chew it up, spit it out, and publicly shame the crew at Brady (our last vivisection can be found here). When the Bradys passed away and their legacy organization fell into disrepair, the scorecarding scam was adopted by the Law Center to Prevent Gun Violence (originally the Legal Community Against Violence). In taking over the project, they committed one of the most heinous sins against rational discourse ever seen. When the Bradys did their scorecard, they at least documented how they graded alleged favorability of various gun control laws. Their system was nothing more than scoring highly the laws they liked (there was never any rigor in matching laws to efficacy). But they were honest enough to allow anyone to peek under the sheets. The Law Center to Prevent Gun Violence was not so burdened (perhaps due to the often commented-upon lack of intersection between lawyers and ethics). Despite my asking for their criteria twice, using different email addresses, they have refused to share their scorecard rubric; likewise, when former Congresswoman Gabrielle Giffords merged her Americans for Responsible Solutions with the law center to create today’s misinformation factory. There is little doubt (as you will soon see) that their approach is slightly less meaningless than a mugger’s claim of innocence. The airbrushed image that Giffords Law Center paints is that strong gun control laws lead to less death. On a professionally styled and illustrated web page, they present their rankings of states by the “strength” of each state’s gun laws, and the magically misleading “gun deaths” statistics (which we have been debunking for nearly 20 years, and which we recently reviewed). The problems herein are a monument to agitprop. As noted above, the scoring rubric is unpublished and likely a cherry-picked charade. Contrast that approach to the one used in The Non-Brady Scorecard we produced a while back, where all was documented and there was a rational, metrics-based approach to scoring legislation founded on both offensive and defensive uses of firearms. Scorecard schema aside, we encounter the first problem, which is that the law center appears to include all forms of gun deaths – legal interventions, justifiable homicides, etc. – into their “gun death” stats. This means they also include suicides. Sigh. Here we go again. Cross-sectional and time-series studies show no correlation between firearm availability and successful suicides. This is due to “substitution of means” whereby a seriously depressed or psychotic person finds a way to die (poison, hanging, suffocation, etc.). 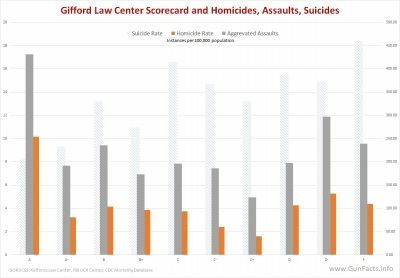 Hence, suicides do not figure into gun policy at all, and should never been aggregated into data for the evaluation of gun access policy. More appropriate metrics focus on specific categories of mayhem, such as violent crime. Which is why the Gun Facts project is here to help the Giffords Law Center out. We added Washington, D.C. into their list and assigned it their A+ rating (The District has such stiff gun control laws, we assume that fits Giffords’ A+ profile … but that is a guess since they don’t publish their scorecard criteria). We got the latest crime stats from the FBI. We included suicide rates (light blue) to show how including them seriously skews numbers toward states they consider to have “weak” laws. 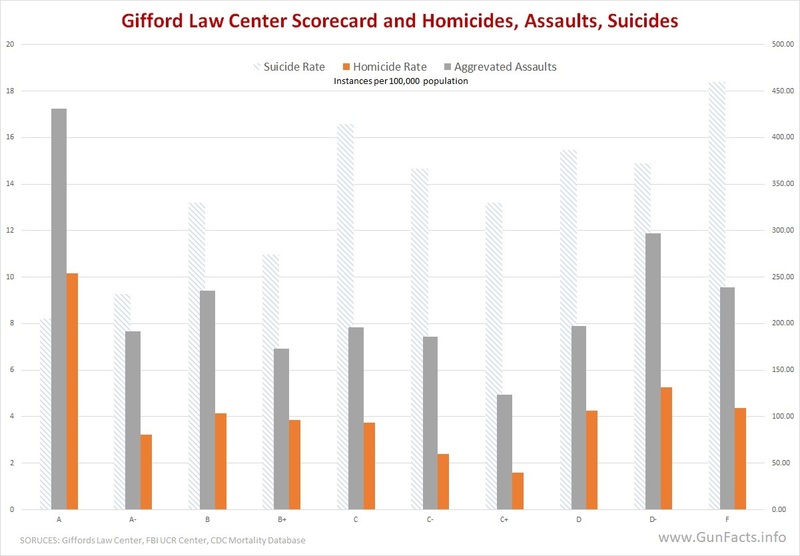 What most people at Giffords Law Center must have known, and thus must have intentionally concealed, is that crime is seriously higher in “strong” gun control states and districts. In A+ rated states and the District of Columbia, the homicide rate was nearly triple the average of all other states (278%), and aggravated assaults were more than double (211%). Even rapes were 40% higher. I guess we have to add one more item to the list of criminal offenses – the Giffords Law Center Scorecard. Your breakdown on firearms deaths, suicides, justifiable homicides, felony murders and finally real murders – the kind we all think or worry about, is a great analysis that helps focus on the real issues as a result. One thing to add to the suicide discussion, that while regrettable, suicides are not a threat to the public which makes them categorically outside the realm of interest in any crime prevention analysis. Further, in my discussions with gun control advocates, they are so in need of including those numbers in their statistics because, when depending on how you winnow down the numbers, finding that there are likely only 5000 deaths by gun that really count, not 33,000 or whatever they try to use, they don’t have a case in the eyes of most rational people. They know this and will go to lengths to avoid this embarrassment. PS – maybe a little more info on who, what, etc re: Giffords would be helpful. Don’t really know who they are. In 2016, the organization merged with Americans for Responsible Solutions, led by former Congresswoman Gabrielle Giffords and Navy combat veteran and retired NASA astronaut Captain Mark Kelly. In 2017, the organization changed its name to the Giffords Law Center to Prevent Gun Violence. 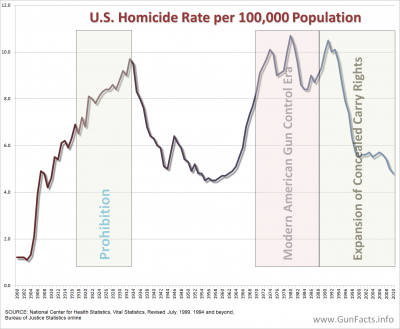 Having sifted the data a few times myself, I can second the notion that if all the states adopted the same laws as the very restrictive states, it would make no improvement at all in the violent crime rate. I don’t know how Gifford creates their ratings, but the Brady’s do publish their formula. One of the inputs to their formula is the gun death rate. Has no one explained to them the problems involved in circular calculations? Thanks for the link. The author articulated the low-pop density issue very clearly (better than I have in the past). We have not (yet) dug into gun vs non-gun death rates in Mexico. It might be of interest in as much as there is likely a very low rate of defensive gun use (DGU) given the restrictions on private ownership in MX.